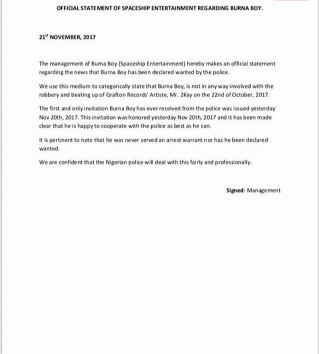 Burna Boy’s management, Spaceship entertainment has released an official statement in response to the story linking Burna Boy to the robbery attack on Mr 2kay. In the statement, Spaceship entertainment confirmed that indeed Burna Boy got an invitation from the police, noting that the invitation has been honoured, while stressing the singer’s innocence. “The management of Burna Boy (Spaceship Entertainment) hereby makes an official statement regarding the news that Burna Boy has been declared wanted by the police. We use this medium to categorically state that Burna Boy, is not in any way involved with the robbery and beating up of Grafton Records’ Artiste, Mr. 2Kay on the 22nd of October, 2017. The first and only invitation Burna Boy has ever received from the police was issued yesterday Nov 20th, 2017. This invitation was honored yesterday Nov 20th, 2017 and it has been made clear that he is happy to cooperate with the police as best as he can. It is pertinent to note that he was never served an arrest warrant nor has he been declared wanted.